The most vital features of Insight—anytime, anywhere. 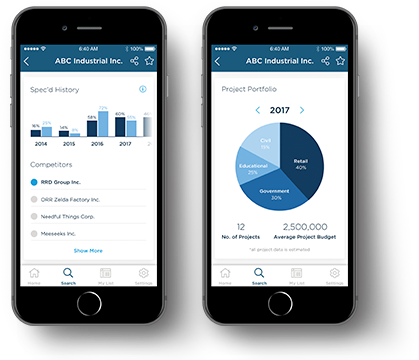 Ensure you have all the project news, information and updates you need to start your day with ConstructConnect’s Insight mobile app. We make it easy to prepare for meetings and stay on top of prospects, projects and contacts while on the go. Whether in between meetings, on the tradeshow floor or flying out to give a presentation, Insight delivers the tools you need to manage your prospects— anytime, anywhere. Get a complete picture of your customers so you can strategically influence the design process. Know who to call no matter where you are. Share and view project leads, specs, drawings and updates across your team. Customize when and how you get notifications. Receive updates on tracked projects and companies on the go. Discover new projects and company leads with easy-to-use search filters and geo-location options. Prep for meetings anywhere. Find the information most relevant to you where you need it the most—everywhere. A ConstructConnect Insight subscription is required to login to Insight Mobile. Learn More.